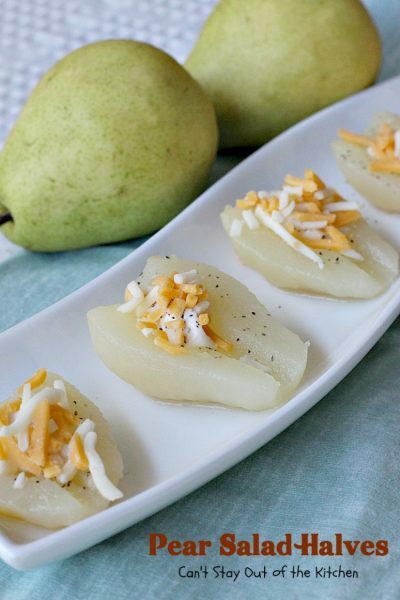 Pear Salad Halves are a family favorite. This is one of the E-A-S-I-E-S-T fruit salad recipes you’ll ever make. So simply, yet so delicious. Pear Salad Halves only have four ingredients. 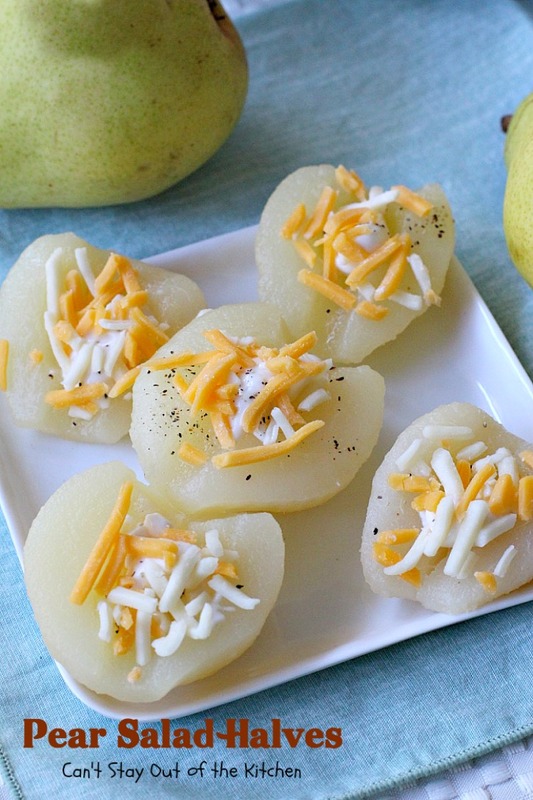 Because you use canned pears you can make them any time of the year. They make a great side for any kind of main dish or as a side for lunch. I’ve made them for potlucks, company and for holiday menus as well. These pears are so cute and delightful, everyone always loves them. Years ago when John and I first got married we went to a friend’s house for dinner and she served this delicious pear recipe along with Glorified Pork Chops, Mashed Potatoes and gravy, and a delicious dessert. 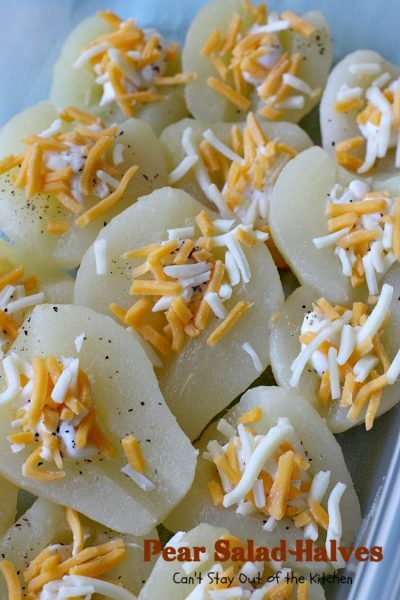 I loved these cute Pear Salad Halves. When she told me what she did to make them, I couldn’t believe it. 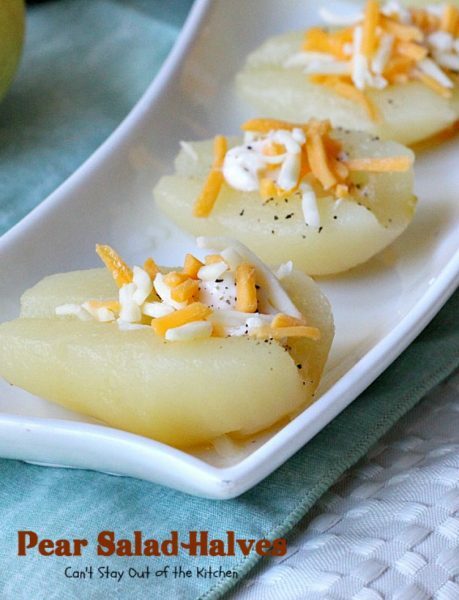 Pear halves, a little Miracle Whip dotted on top of each one, sprinkled with pepper and then a few gratings of cheddar cheese. That’s all there is to it. Did I say E-A-S-Y??? Yes. You have to remember when I first got married, I didn’t know how to cook a lick. My husband was a much better cook when we got married–he could cook circles around me. So any recipe like this that was so easy, yet so delicious was one I had to get my hands on. I used to make these pears a lot when we were first married. It’s been quite awhile since I’ve made them–I think because I just forgot about them. Then when I was working on my cookbook a couple of weeks ago, I ran across the recipe again and decided it would be a quick and easy salad to make for friends who were moving into our new neighborhood. I was looking for something quick and easy, and Pear Salad Halves surely pass that test! I also made a batch with peaches. 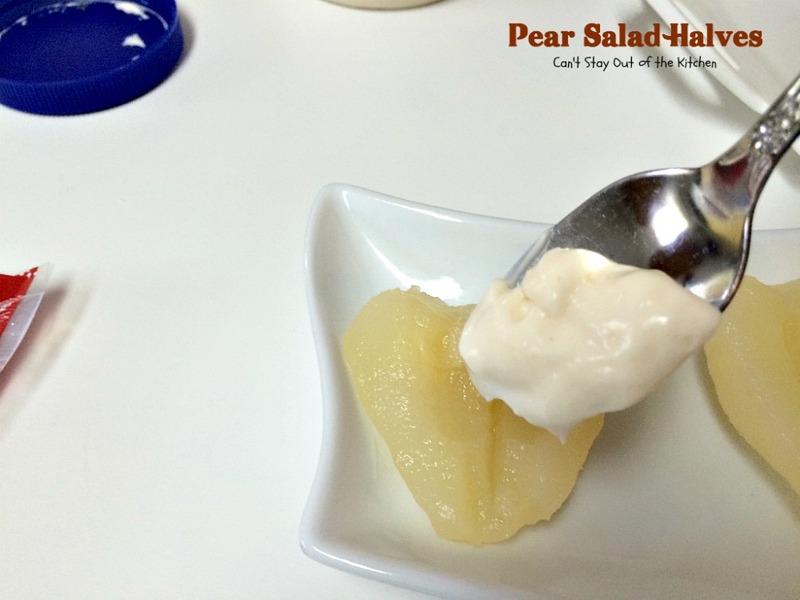 Pear Salad Halves are so easy to make, yet so delicious to the taste buds. 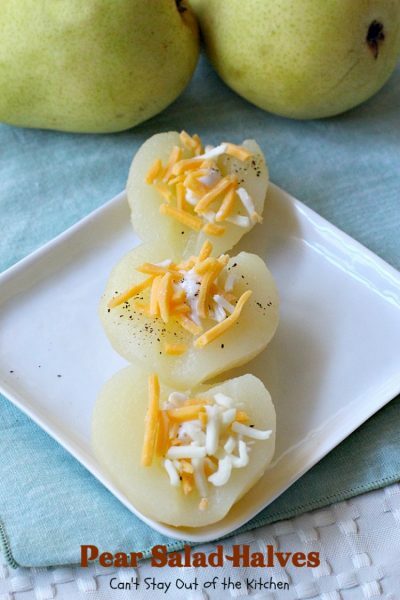 Pear Salad Halves is a great alternative to heavy side dishes and casseroles. Cheese really makes these pears scrumptious. I used these four ingredients. You can use mayonnaise instead of Miracle Whip, but you will have to add a pinch of sugar on top of the mayonnaise when you dab it on the pears in order to get the same flavor. Drain pears. Place on serving plate. 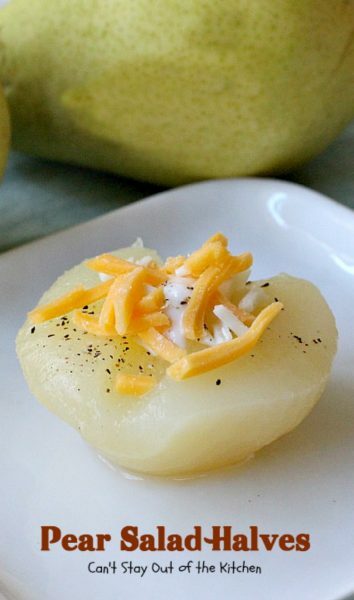 Add a dab of Miracle Whip into the core of each pear half. Sprinkle pear halves very lightly with pepper. 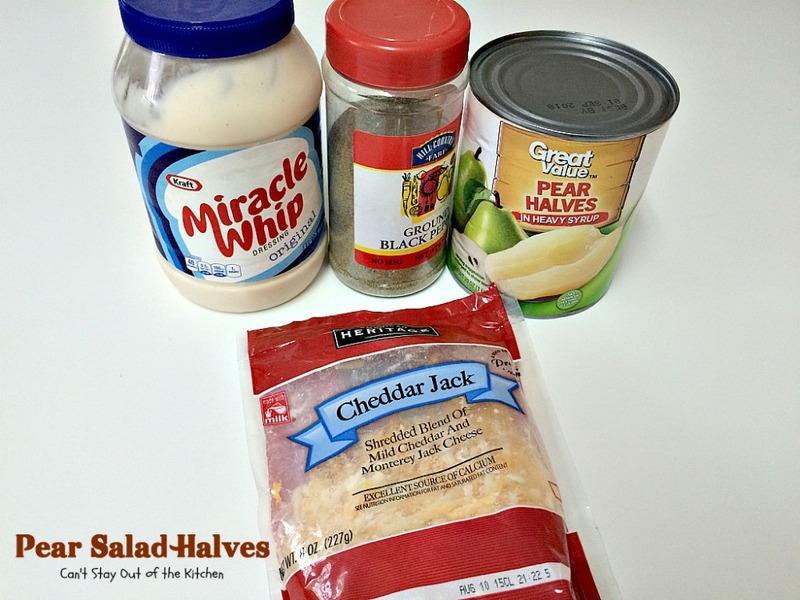 Drop cheese gratings on top of the Miracle Whip to cover. Refrigerate until ready to serve. For only four ingredients, these are some of the best pears you’ll ever eat! If you have your own pear trees and can the pears during the summer, this is a great way to use up pear halves. But even if you don’t have your own pear trees, these are easy to make and have ingredients that are easy to locate 365 days a year! Delicious 4-ingredient fruit salad that is so quick and easy. 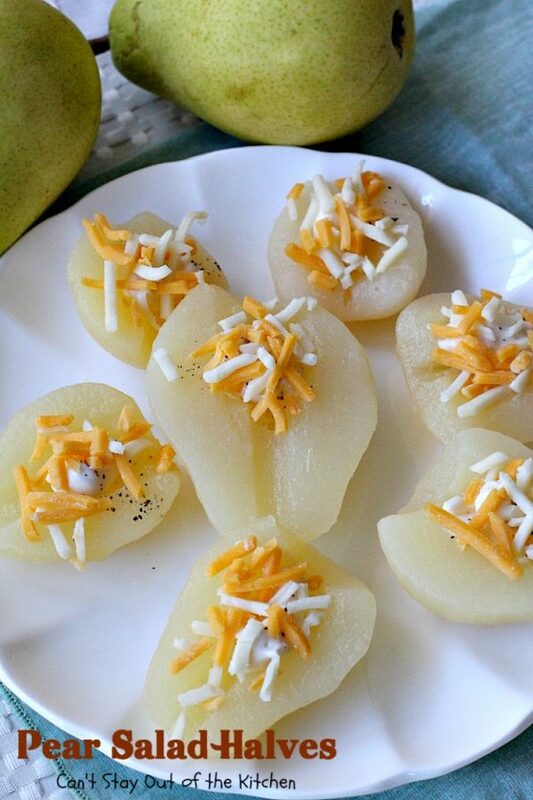 Cheddar cheese on pears makes them sensational. Please desired amount of pear halves in serving dish or pan. Put about ½ to 1 tsp. Miracle Whip in the center of each pear half. Top with about 1 tbsp. cheddar cheese. NOTE: If you substitute mayonnaise for the Miracle Whip you have to add a dash of sugar on top of the mayo to achieve the same flavor. 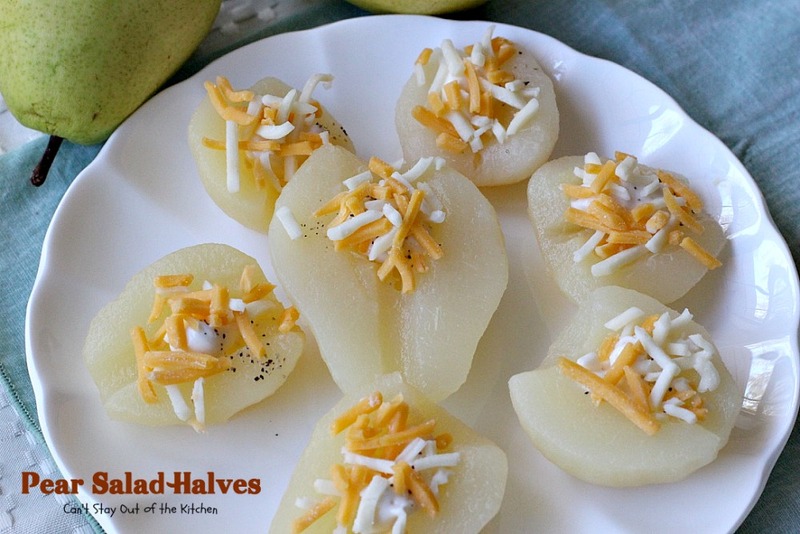 Pear Salad Halves is a great side dish for company dinners and holiday menus. So simple yet so delectable. If you enjoy pears, you’ll love this tasty salad. If you like peaches, you’ll enjoy making this with peaches as well.